One of the first things you’ll come to quickly realize about the Outer Banks is how diverse the beaches are. There are over 100 miles of shoreline in Dare County connected by the legendary coastal two-lane highway NC 12. Depending on your personal preference, you can find public beach accesses with ample paved parking, modern bath houses and nearby beach convenience shops, or you can immerse yourself in the natural or even primitive beaches of the Cape Hatteras National Seashore best accessible by a 4x4 off-road vehicle. The choice is yours. As a general rule, what we collectively call the Northern Beach towns of Duck, Southern Shores, Kitty Hawk, Kill Devil Hills and Nags Head have a nice mix of footpaths, wooden crossovers, and free public parking. There’s not “one beach” that everyone goes to like you might find in some big city beaches. Because the islands are generally about a mile wide, folks usually go from their accommodations and walk or drive to the beach access that’s closest, or towards the sound waters. There’s a bit more development here, and with that, more in the way of familiar conveniences. If you want to go a little more rustic or get even closer to nature, then you may want to try one of the Hatteras Island villages, which are Rodanthe, Waves, Salvo (sometimes called the Tri-Villages because of their proximity to one another), Avon, Buxton, Frisco and Hatteras. You have oceanfront accommodations like the Northern Beach towns, but the setting is a bit more spread out, and a single coastal two-lane highway links them all. The major difference here is that you have the Cape Hatteras National Seashore just outside village limits, where there is no development at all. This is one of the most special places in America; just sand dunes, sea grasses, wildlife and a few access ramps for pedestrians and 4x4 vehicles to get you as close or far away from civilization as you care. One note, if you want all of the sun and fun of the Atlantic Ocean beaches without the big waves, you may look into visiting one of the numerous sound front water accesses on the western side of the islands instead. The water tends to be a little calmer and in many places, a lot shallower. Duck is known as one of the most pet-friendly beaches in the United States, allowing for dogs to be off-leash as long as they’re under the owner’s control. There are no public beach accesses in the Town of Duck, accesses are privately owned by Home Owners Associations and each access is limited to residents and vacationers staying in a property within the Home Owner’s subdivision. Southern Shores has great public beaches, but beach parking is limited to vacationers or residents who are staying in a home or property within town limits using day passes or window stickers. Kitty Hawk and Kill Devil Hills are known for great surfing and skimboarding, usually having the biggest waves on the Northern Beaches. Nags Head just finished a 12+ mile beach nourishment program, giving you twice as much room to spread out and play than anytime in the past. Rodanthe, Waves and Salvo, known locally as the “Tri-Villages” because of their shared borders, are known for big waves and being close to the Cape Hatteras National Seashore beaches. Avon has the largest population of local residents that live on Hatteras Island year round. Buxton is the village closest to the actual Cape Hatteras and fishing hotspot “Cape Point” as well as being home of the tallest lighthouse in America. Frisco has some great 4x4 beach driving and recreation, and is home to a few campgrounds. Hatteras offers great local shopping and dining, and big swaths of beach for casual beach goers and 4x4 driving south of village limits. If you are interested in relocating your business to the Outer Banks, or moving here on a full or part-time basis, please contact the Outer Banks Chamber of Commerce. 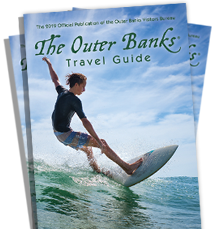 The Chamber and its member businesses provide a range of services and products unique to the Outer Banks and helpful staff ready to assist you.